The UCSC Refuse and Recycling Program has been collecting recyclable materials from across campus since 1989. The university's goal is to achieve Zero Waste by 2020. Campus recycling divertS materials from the waste stream. Instead of going to the landfill, these materials are reused or recycled by industry vendors and turned into new products. UC System goals for diversion are 75% by 2012 and 90% by 2020. The Recycling Team collects materials from recycling bins all over campus. The Recycling Program currently collects for refuse and compost in selected areas. Streams of materials in public areas: Mixed Containers, including plastics, aluminum, and glass in one bin; Mixed Paper in another bin. In office spaces, white office paper is also collected separately. Members of the UCSC community can easily recycle their materials in the recycling bins that are located at all residential colleges, classroom buildings, offices, cafes, and most other parts of campus. Cardboard is recycled in big green dumpsters that are located at the loading docks of most buildings. The cardboard is then collected using front loader trucks and it is recycled. Reduces the amount of land that is converted to landfills. Transforming recyclable material into a new product requires less energy than making the same product out of raw material. Manufacturing with recycled materials significantly reduces the amount of energy, water, and pollution needed in contrast to using raw materials to excavate, mine, or harvest the raw materials. Natural resources such as forests, mountains, and bodies of water are impacted less when recyclable materials we used. Recycling is an important part of waste reduction. There are many exciting ways to get involved with Refuse and Recycling at UCSC. Students are always needed on the Recycling Work Crew. Check out the posts at UCSC Career Center. 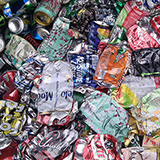 A student can earn academic credit as an intern with the Recycling Program, working on such projects as outreach, grant writing, and event organizing. Check with your department or the Environmental Studies Internship Coordinator for more information. Campus wide refuse and cardboard dumpster services are performed by the Grounds Equipment Shop. A team of four equipment operators share in the responsibilities of maintaining service to campus. Refuse and cardboard dumpsters are located throughout campus to service all university facilities. In addition, this team manages the organics roll-off box delivery for kitchens and cafes! The first step you can take is to source separate and recycle correctly. Make sure your recyclables end up in the right place. Click here to see the distribution of all items.